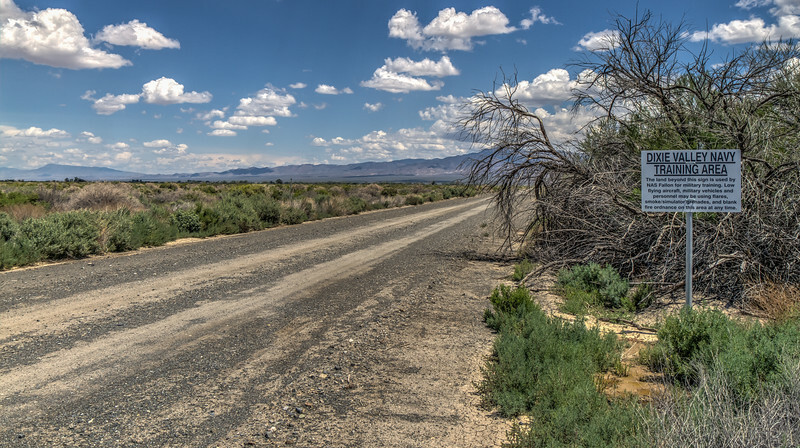 The Dixie Valley is a remote part of northern Nevada that is a rare example of a simulated hostile nation on American soil, open to the public. Military equipment, both functional and not, is scattered among the ruins of old homesteads and ranches, a landscape that represents an integrated air defense system comprised of 37 real or simulated radars, the defenses of a generic hostile land. It is part of a network of training ranges used primarily by the Navy that includes five closed and fenced ranges totaling more than 80,000 acres (Bravo 16, 17, 19, 20, and the Wilson Electronic Combat Range), under a military airspace of more than 6 million acres. Unlike these closed ranges, however, the Dixie Valley is still accessible to the public, though it is so remote few make the journey. The Center for Land Use Interpretation describes the valley as the nation's only Drive-Thru Electronic Warfare Park.